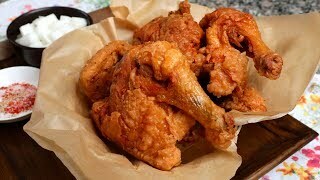 Let’s make traditional market-style Korean fried chicken! 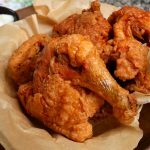 I’ve introduced you to many kinds of Korean fried chicken before, and now I want to show you one more! It’s called sijang-tongdak: 시장통닭 (literally: “market chicken”). Unlike some other Korean fried chicken recipes this one doesn’t use a coating sauce. The chicken is just dipped in a batter and double fried. It’s super crispy and delicately crunchy on the outside and soft and juicy on the inside. Every Korean market has a food section, and this chicken is one of the most popular items because it’s cheap and delicious. The batter uses roasted soybean powder, which give it a beautiful color and a nutty flavor. I learned this tip from the Korean fried chicken shop near my cousin’s house in Korea. She lived in the market, right next to the chicken place, and every time she had guests over she would run out and get some chicken from the shop. Who wouldn’t like hot and crispy freshly fried chicken? One day I followed her to the shop and got a chance to see how they made the chicken and ask some questions. Normally the shop wouldn’t tell anyone their secrets, but the owner was friends with my cousin, so she gave me her tips. This chicken is irresistible! It’s best to eat it right after making it, when it’s hot and fresh and crispy. It will get soggy if you wait too long. With a sharp kitchen knife or scissors, snip the flesh between the thigh and the body and around the wing of each chicken half. Evenly season with ¾ teaspoon salt and ½ teaspoon pepper. Refrigerate 1 to 2 hours or overnight. But if you are busy you can go next step right away. Evenly coat with ¼ cup flour. Combine the batter ingredients in a large bowl. Whisk or mix well with a spoon until there are no lumps. Add all the dipping ingredients in a small, shallow bowl. Set aside. Heat 2 inches of cooking oil in a fry pan or pot until it reaches 350ºF (I used my 5 quart cast iron pot). Add the onion chunks and fry until brown. Remove the onion with tongs or skimmer. Whisk the batter again so it’s well-mixed and then and dip one chicken half so it’s evenly coated. Lift the chicken and let the batter drip off, then put it into the hot oil. Let cook for 2 minutes and then turn it over with tongs. Fry for another 10 minutes, turning over occasionally. Take it out and put it on a wire mesh strainer over a stainless steel bowl. Repeat with the other chicken half. Heat up the oil again to 350ºF (about 30 seconds to 1 minute) and add a chicken half. When the oil starts bubbling vigorously, grab the chicken with your tongs in one hand, and with your kitchen scissors in the other hand cut some slashes into the thick thigh and breast. This will help the chicken cook thoroughly, make it more crispy and crunchy, and make it look more appetizing. Fry the chicken 10 to 11 more minutes, turning over occasionally. Take it out and put it in a mesh strainer lined with paper towels, and fry the other chicken half. Posted on Wednesday, January 30th, 2019 at 7:05 pm. Posted February 6th, 2019 at 7:07 am | Log in to reply. I’m making this right now. :) I saw the video of this too. You said if there’s no roasted soy bean powder, we can use flour. I was wondering, what if i rub soybean paste (Doenjang) on the chicken, will it turn out okay? Posted January 31st, 2019 at 2:39 pm | Log in to reply. This looks absolutely delicious I love how you Fred the whole chicken also the chicken looks very small. What chicken did you use? Posted January 30th, 2019 at 10:26 pm | Log in to reply. Looks wonderful, Maangchi! I will probably make mine hot and spicy, because I like hot and spicy! This recipe was originally posted on January 30, 2019 at 7:05 pm by Maangchi. The video was watched 573,380 times on YouTube & has 19,435 likes!